Posy Simmonds is well known British cartoonist known for re-intrepreting classic literature in a modern setting in serial comic strips. Her TAMARA DREWE, a version of Thomas Hardy's Far From The Madding Crowd, was adapted as a film in 2010 by Stephen Frears with mixed results. On the whole, I much preferred this Franco-English adaptation of Simmonds GEMMA BOVERY. 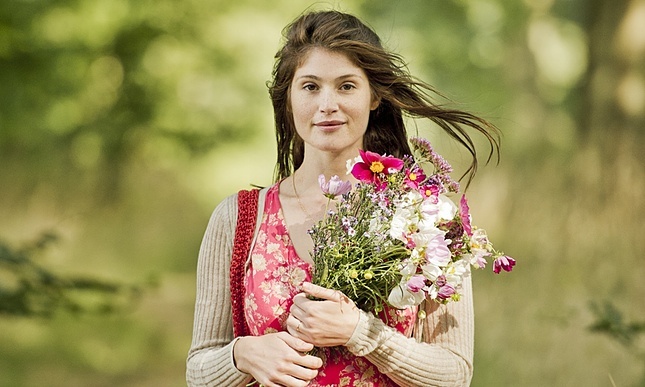 In this version of Flaubert's iconic tale of middle class married boredom, tragic love and debt, the heroine is played by Gemma Arterton (who also played Tamara Drewe). Mrs Bovery has moved to a small town in northern France to live with her husband (Jason Flemyng), a humble decorator. However, it soon becomes apparent that she has tastes of something grander and more sensuous. She buys things that she can't afford on a whim, and there are hints of previous, richer lovers. For no other reason than just to see what it's like, she cheats on her husband with the local nobleman, a rather pale imitation of the novel's Rodolphe. All this is observed by the town's baker, Martin Joubert (Fabrice Lucine - POTICHE). He's a man obsessed with Flaubert's novel, attracted to Gemma, and almost willing her to re-enact the story, although not of course its ending. The result is a wonderful performance of wry tragicomedy that sets the tone for this charming and sometimes deeply moving film. I also love the wry social commentary that Simmonds is famous for. In this case, it's embodied in the Franco-English couple Rankin (Pip Torrens) and Wizzy (Elsa Zylberstein) - Notting Hill yuppies with a lavish second home in France. The movie perfectly satirises their social climbing and insecurity. The problem is the inevitable clash of tone, which director Anne Fontaine doesn't handle well, especially in the final act of the film. Maybe no-one could and the ultimate fault lies with Simmonds for shoe-horning in that ending....Either way this remains a charming and occasionally very clever movie, if flawed. GEMMA BOVERY has a running time of 99 minutes and is rated R. The movie played Toronto 2014 and was released last year in Belgium, France, Luxembourg, Austria, Germany, the Netherlands, Lithuania, Greece and Portugal. It was released earlier this year in Italy, Estonia, Hungary, Norway, Russia, Kazakhstan, Uzbekistan, Australia, New Zealand, the USA, Turkey and Brazil. It is currently on release in the UK and Ireland.